The 10" long, fishy dish - below, left - is a contemporary piece made by the Akcam Glass Company in Kurtköy , Turkey, located close to the shores of the Black Sea (the company was founded in 1946). It is gently iridised in marigold hues: it’s wonderfully practical and deliciously wacky! Our thanks to Angie Thistlewood. 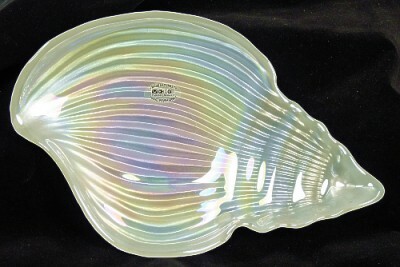 Another piece from the Akcam Glass Company in Kurtköy, Turkey is this white iridised conch shell serving dish, below, right. It measures 11" in length. Like the fish, it is not only practical but also quirky and very pretty.